THE LAW SAYS: If you are currently looking to sell or rent your property in Spain then you are obliged by law to have an ESP., (Energy Performance Certificate / Certificado de Eficiencia Energetica). If you do not already hold an EPC and you are selling or renting your property then you will need to contact us to arrange this as soon as possible. The EPC is an official report that describes how efficient your home is in terms of energy consumption. An EPC certificate will show a rating ranging from "A" (most efficient) to "G" (least efficient). How to I obtain an Energy Performance Certificate? To obtain an EPC your home needs to be assessed by a fully qualified assessor / architect. Hondon Villas have a contact list of EPC assessors and their fees are one of the lowest in the area. Just call us to arrange an EPC for you. The official assessor will visit your home and rate it according to the official energy efficiency scale. He/She will check your hondon area home and take measurements. Your home will also be registered with the correct authorities. The EPC certificate will be valid for 10 years from the assessing date. However, if your home undergoes any renovation or major structural changes then it will need to be re-assessed. How much is it to obtain the energy performance certificate? Well it actually depends on the size of your property and local costs. The larger the property, the higher the cost due to the extra work required. In general, a typical 3 bed / 2 bath family villa would be approx' 150€ + IVA. 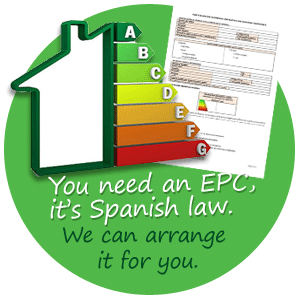 You will need a valid EPC certificate BEFORE SELLING your Spanish property (either for sale or rent). This certificate needs to be produced at the notary on the day of completion.